1. Fancy candles are always a good idea. This set from Byredo is a new discovery and I love all the scents! And the packaging is minimal and so chic. 2. Diptyque anything! Diptyque holiday packaging is like no other and the candle set is perfect for a luxury lover. It comes in two different sizes so you can determine just how much you want to splurge. Ha! 3. The ultimate advent calendar. 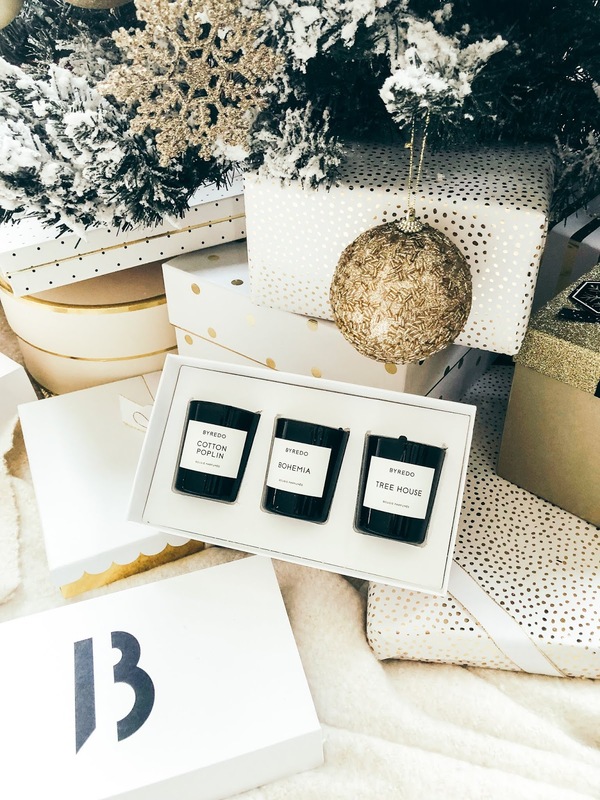 Continuing the Diptyque love, their advent calendar is one of the biggest sellers for them but it is a major spend. However, it manages to sell out so quickly every year so clearly it's worth the splurge. If perfume is more your preference, this Atelier Cologne Advent Calendar is gorgeous with a great selection of scents. And if you want one that encompasses everything beauty, this set from Net-a-Porter is the one to buy. 4. Pampering bath products. This bath line is well priced but feels more expensive than it is, and the scents are delicious. This is my favorite rose scent and the body wash is a nice way to enjoy this luxurious line at a more manageable price point. Fancy hand soap is something we rarely buy for ourselves but it would make a great gift! And nothing says "I'm fancy and fabulous" like pulling this hand cream out of your bag. The most elegant stocking stuff ever! 5. Fancy makeup with even better packaging. This line of lipsticks has some of the best packaging as well as one of the best formulas. I've been raving about this eye shadow palette over the past few weeks and it's one that I would highly recommend giving to a fellow makeup lover (also available here)! 6. The ultimate lipstick set. If someone in your life just got a huge bonus or major promotion this year and they want to spoil you, this lipstick set is the one to ask for! This other one is a tenth of the price but would still be amazing to receive. 7. For the person that has all the makeup and skincare. They need something fabulous to carry it all in like this marble print travel case. Or maybe upgrade their at home makeup routine with this luxe mirror. 8. Skincare sets worth splurging on. I use almost every single product from this line and love them all (including the cleansing balm which is a staple for me). This microneedling set is actually what I would love to receive and have been wanting to try it for the past year! Jade rolling and facial massage is all the rage right now but this facial roller is the ultimate splurge (and here it is in a set). I have it and use it every day. It can also be used on the body because of it's larger size which helps to justify the price a bit more (a small bit but still). Sunday Riley sets are always popular and this one has a great selection of her products. 9. Limited edition skincare packaging - As a packaging fanatic, I love the holidays because all the fancy limited edition versions come out. This larger version of Vintner's Daughter has the most gorgeous bottle design, while the holiday SK-II Facial Treatment Essence bottle has become a collectors' item at this point. 10. Splurgeworthy hair products. I use this curling iron every single day and it's worth every penny. It heats up quickly and my curls last all day. And if this texturizing spray (which is one of the best) is a must have for you, this limited edition size and bottle should be on your wish list. 11. A few other random beauty products not to miss - this silk set which is the ultimate luxury. I love sleeping on a silk pillowcase and this is the gold standard. For the decor obsessed, this candle is absolutely gorgeous! I plan on ordering this for myself. Stay tuned for my next gift guide coming next weekend! !